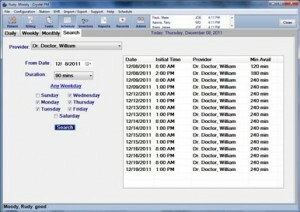 The Schedule module manages doctors’ and other staff members’ schedules. Daily (default), Weekly and Monthly viewing options are available, and a Search function lets you locate available times for scheduling patient appointments. Click the Schedule button in the Main Toolbar. The Daily Schedule page provides a quick view of all scheduled appointments for all Doctors and staff members for the currently selected day. The schedule is divided into 15-minute increments, with the screen centered on the current time-of-day. Each appointment on the schedule shows the name of the patient and the billing code (if one was specified when the appointment was set). The Color Code provides a visual means of distinguishing the current status of each time block (see Section 5.2.4, Managing the Color Code on page 5-3 for details). To view the schedule for another day, select the desired day on the calendar in the top-left of the window. To schedule an appointment, right-click at the desired time for the desired doctor and select Make Additional Appointment from the shortcut menu (see Section 5.4.1, Setting an Appointment on page 5-4 for details on scheduling appointments). To view or edit appointment information for a currently scheduled appointment, double-click the desired appointment. To view the patient file for any patient, right-click, then hover over the desired patient’s name and select View Patient (see Section 2.4, Quick View on page 2-3 for more on the patient Quick View page). To view the billing information for any patient, right-click, then hover over the desired patient’s name and select View Billing (see Section 3, Billing for details on patient billing). To view medical records for any patient, right-click, then hover over the desired patient’s name and select View Records (see Section 8, Records for details on medical records). The Weekly Schedule page provides a “quick view” of all scheduled appointments for a single Doctor or staff member for the currently selected week. To view the schedule for a different staff member, or for a different week, use the options at the top of the calendar. Otherwise, the Weekly schedule works identically to the Daily schedule. The Monthly Schedule page shows a quick view of the number of appointments scheduled for a selected staff member during a selected month. To schedule an appointment for the currently selected Provider, right-click on the desired date and select Create New Appointment (see Section 5.4.1, Setting an Appointment on page 5-4 for more on scheduling appointments). To view the Daily or Weekly Schedule page for a currently displayed date, right-click and select Show Daily View or Show Weekly View. 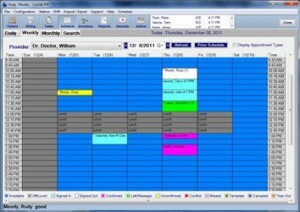 The Color Code provides a visual means of distinguishing the current status of each time block on the Daily and Weekly Schedule screens. Each status can be assigned a unique color. Available status/appointment values and the currently assigned color code for each status/appointment are shown on the left of the Daily Schedule screen. The system is preconfigured with default colors for each available status/appointment category. If desired, you may change the color code for any status/appointment category by clicking on the color in the color code. Access to the color code maintenance is password protected. There are two types of color codes: Status and Appointment Type, which are toggled with the Display Appointment Type checkbox. Available – the staff member is available to accept a patient appointment. Signed In – a patient on the schedule has signed in at the front desk. Signed Out – a patient has been checked out/billed out by the front desk. Confirmed – the patient has been called and has confirmed the scheduled appointment. Left Message – the patient has been called and a message was left to confirm the appointment. Unconfirmed – the patient has not been called or confirmed. This is the default color an appointment whe it is first created. Conflict – there are more than two appointments scheduled for the same time. Missed – the patient has missed a scheduled appointment without calling in to cancel beforehand. Template – indicates times in the schedule when certain appointment types should be scheduled (for example, a Doctor may wish to schedule appointments for Glaucoma patients between 10:00AM and 12:30PM). This color code serves as a reminder to the front desk. Canceled – the patient has canceled the appointment that was scheduled at this time. Year-Out – the Year-Out checkbox was selected when this appointment was booked (usually used to indicate that the appointment was booked a long time in advance). Appointment Type values are managed in the Schedule section of the Administration module (see Section 9.3.19 on page 9-21 for details). 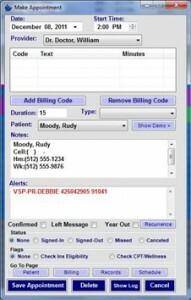 Display Invoices – if selected, each appointment will show, next to the patient name, the number for any invoice assigned to that patient on that day. The Search page lets you search for available times for a selected Doctor for the purpose of scheduling future appointments. 1 On the Schedule screen, select the Search tab. 1 Select the name of the Doctor or other staff member for whom you wish to locate “available” time from the Provider menu. The Provider menu lists all staff members for whom patient appointments can be scheduled. 2 Enter the starting date from which you wish to search for “available” time in the From Date field. 3 Select the length of time needed for the appointment from the Duration menu. Selections range from 15 min to 2 hours, in 15 minute increments. 4 Use the Sunday through Saturday checkboxes to select the days of the week to include in the search, or click Any Weekday. 5 Click the Search button to submit your search. The Search screen refreshes to display a list of dates for a two week period (beginning on the specified From Date) on which there is available time to schedule patient appointments. 6 Double-click a line in the listing to view the Daily Schedule page for the selected date. 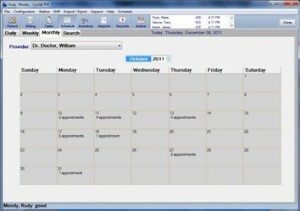 The Make Appointment dialog is used to create new appointments for a patient and to edit existing appointments. You can display the Make Appointment dialog from the Daily (see Section 5.2.1 on page 5-1), Weekly or Monthly (see Section 5.2.3 on page 5-2) schedule pages. 1 Open the Make Appointment dialog from the Daily, Weekly or Monthly Schedule page. 2 Enter the desired Date and Start Time at the top of the window. 3 Select the Doctor or other staff member from the Provider menu. 4 Add billing codes to the appointment if desired (see Section 5.4.2, Adding Billing Codes to an Appointment on page 5-6 for details). 5 Enter the length of time you wish to schedule for the appointment (in 15-minute increments) in the Duration text box. If billing codes were added to the appointment (see Section 5.4.2, Adding Billing Codes to an Appointment on page 5-6 for details), the Duration text box shows the total number of minutes for all billing codes added to the appointment. You can modify the appointment Duration as desired. 6 Select the appropriate appointment Type from the dropdown menu, if desired. When an existing patient is selected for an appointment or a new patient is created for an appointment, the Alerts field populates automatically with any relevant alerts, and the Notes field populates automatically with the patient’s name and home and work phone numbers. You may edit the content of the Notes or Alerts fields as desired. At any time you can view additional information on the patient, including primary provider, guardians, birthdate, and insurance information, by clicking the Show Demo button. If a patient is currently selected, the Patient, Note and Alerts fields are prefilled with the appropriate information. If no patient is currently selected, or you wish to schedule the appointment for a different patient than the one currently selected, click on the dropdown menu and find the patient or create a new patient, as required (see Section 2.2, Adding & Searching for Patients on page 2-1 for details). Select None to schedule time for a patient whose name you do not know, or if you wish to block out time when a doctor will not be seeing patients. 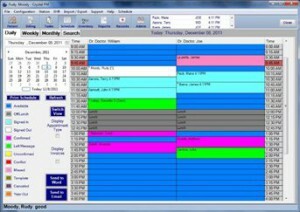 Select Template to reserve a block of time for a particular activity (for example, surgeries on Thursday afternoons). When using this option, enter the template name in the first row of the Notes section. When a patient is scheduled for an appointment during a Templated timeslot, the system will replace the template with the new appointment for that block of time, rather than displaying what appears to be a double-booking. 8 Change any Notes or Alerts as desired. Changes made in the Notes or Alerts fields will not affect the patient’s record. 9 If desired, you may use the Recurrence button to set “recurring appointments” for the current patient (see Section 5.4.3, Setting a Recurring Appointment on page 5-6 for details). Recurring appointments are generally used by vision therapists who wish to see a patient at regular scheduled intervals, or when creating a template. 10 Add any Flags required by selecting the radio buttons at the bottom of the Make Appointment window. 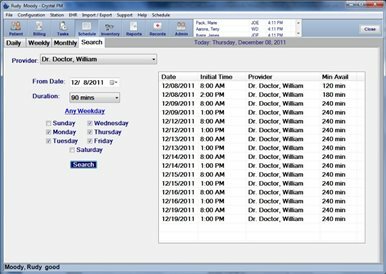 11 When all desired information has been entered, click the Save Appointment button to save the appointment to the schedule and return to the Schedule, or click the Patient, Billing, or Records buttons to save the appointment and go to the selected page for that patient. The Confirmed and Status fields are used when editing appointments (see Section 5.4.5, Editing Appointments on page 5-7 for details). Billing codes can be added to an appointment to make the Doctor aware of the reason for the appointment. Adding billing codes to an appointment is optional. You may also remove billing codes that were previously added to an appointment. 12 On the Make Appointment dialog (see Section 5.4.1, Setting an Appointment on page 5-4 for details), click the Add Billing Code button. The Add Billing Code dialog displays. 13 Select the desired billing code or billing code description in the Billing Code or Billing Text menu. 14 Click the OK button. The Add Billing Code dialog closes, and the selected billing code and description are added to the Billing Code list on the Make Appointment dialog. Each billing code has a number of minutes associated with it. By selecting a series of billing codes, the total duration of the appointment will calculate automatically. To remove a billing code from an appointment. 15 On the Make Appointment dialog (see Section 5.4.1, Setting an Appointment on page 5-4 for details), click the billing code you wish to remove from the Billing Code list; the selected billing code will be highlighted. 16 Click the Remove Billing Code button. 17 From the Make Appointment dialog (see Section 5.4.1, Setting an Appointment on page 5-4 for details), click the Recurrence button. 18 Use the Pattern radio buttons to select Daily, Weekly, Monthly or Yearly, then enter the appropriate interval for the appointment using the options provided for the selected pattern. 19 Use the Start Recurrence field to specify the date on which you wish the recurring appointments to begin. 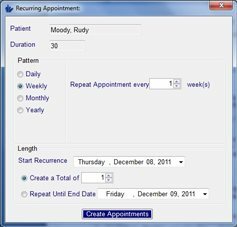 20 To schedule a specified number of recurring appointments, select the Create a Total of __ Appointments radio button, then enter the desired number of appointments in the Create a Total of __ Appointments text box. 21 To schedule recurring appointments until a specified date, select the Repeat Until End Date radio button, then specify the date on which you wish the recurring appointments to end. 22 When the appropriate information has been entered, click the Create Appointments button to save the recurring appointments to the schedule. If desired, you can schedule multiple appointments for the same Doctor for the same time period. Add a second appointment in the same manner as adding any other appointment (see Section 5.4.1, Setting an Appointment on page 5-4 for details). When two appointments are scheduled for the same time, they appear “side-by-side” on the Daily Schedule page and the Weekly Schedule page. If three or more appointments are scheduled with the same Doctor for the same time period, the time period on the Daily and Weekly Schedule pages shows the “Overbooked” color, and the total number of appointments booked for the time period. If a patient is scheduled for an appointment during a timeslot reserved for a Template, the system will replace the template with the new appointment for that block of time, rather than displaying it as multiple appointments. You can edit an existing appointment to revise previously entered information, mark the appointment as confirmed, and change the appointment status (check the patient in or out). 23 Access the Make Appointment dialog for the desired patient from the Daily Schedule page or Weekly Schedule page, as desired. The Make Appointment dialog is prefilled with the previously entered appointment information. 24 Make changes to Date, Start Time, Provider, billing codes, Duration, Notes or Alerts, as desired, using the procedures described for setting an appointment (see Section 5.4.1, Setting an Appointment on page 5-4 for details). 25 To confirm an appointment, to note that a message was left for the patient or to note that the appointment is being booked a long time in the future, select the Confirmed, Left Message or Year-Out checkbox. The Confirmed and Left Message checkboxes are not available for “None” or “Template” appointments. None – This is the default status applied when the appointment was created. Signed In – Select this status when the patient signs in for the appointment. Signed Out – Select this status when the patient signs out from the appointment. Missed – Select this status if the patient missed the appointment. Canceled – Select this status if the patient calls to cancel and you wish to keep the appointment time on the schedule rather than rescheduling or deleting. 27 When all desired changes have been made, click the Save Appointment button to save your changes to the database. If a patient cancels an appointment, you can mark it canceled (see Section 5.4.5 above) or you can delete the appointment from the schedule entirely. 28 Access the Make Appointment dialog for the appointment you wish to delete. 29 Click the Delete button. 30 Click Yes to confirm.